WISE Stands For The Wide-Field Infrared Survey Explorer. WISE spacecraft is an infrared surveyor. WISE is a NASA-funded scientific research project scheduled for launch on November 1, 2009. 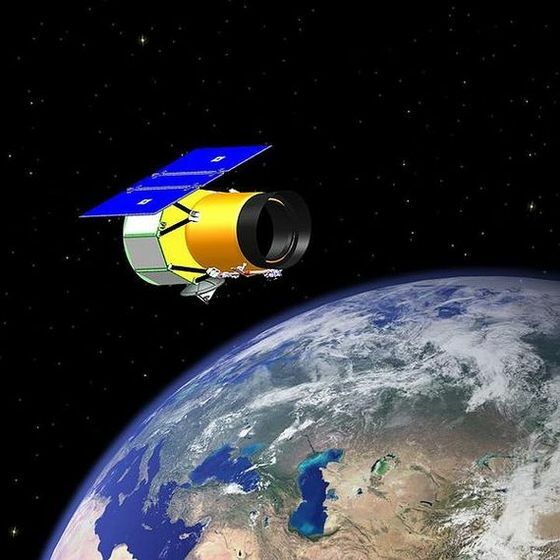 The WISE satellite will carry a 40 cm infrared-sensitive telescope and provide an "all-sky" survey in the 3 to 25 µm wavelength range (3.3, 4.7, 12, and 23 µm). The WISE survey will be at least 500 times more sensitive than IRAS or Akari. WISE is the an acronym for: Wide-Field Infrared Survey Explorer. General information about WISE. Organization NASA/JPL. WISE Major contractors - Ball Aerospace, Lockheed Martin, Space Dynamics Lab, SSG Precision Optronics. WISE Launch date - 1 November 2009. WISE Launch vehicle Delta II 7320-10. WISE Mission length - 8 months. Mass - 750 kg. WISE Website http://wise.ssl.berkeley.edu. The WISE spacecraft will be placed in a 525 km, circular, polar, synchronous orbit for its seven month mission, during which it will take 1.5 million 11-second exposure images, each covering a 47 arcminute field of view. The complete mission will include 99% of the sky with at least eight images from each position to increase accuracy. The image library produced will contain data on the solar system, the Milky Way Galaxy, and the Universe. Among the objects WISE will study are cool, dim stars such as brown dwarfs, asteroids, and the most luminous infrared galaxies. WISE is scheduled for launch on November 2, 2009. It has been approved by NASA to proceed to the construction stage. Construction is divided between Ball Aerospace & Technologies Corp. (spacecraft, operations support), SSG Precision Optronics, Inc. (telescope, optics, scan mirror), DRS and Rockwell (focal planes), Lockheed Martin (cryostat, cooling for the telescope), and Space Dynamics Lab (instruments, electronics, and testing). The program is managed through the Jet Propulsion Laboratory. The WISE spacecraft is built by Ball Aerospace and Technologies Corp. in Boulder, Colorado. The spacecraft is derived from the Ball Aerospace RS-300 spacecraft architecture, particularly the NEXTSat spacecraft built for the successful Orbital Express mission launched on March 9, 2007. The flight system has an estimated mass of 560 kg (about 1,175 pounds). The spacecraft will be three-axis stabilized, with body-fixed solar arrays and use a high-gain antenna in the Ku-band to transmit to ground through the TDRSS geostationary system. In addition to building the spacecraft, Ball Aerospace will perform test and flight system integration. On November 8, 2007, the House Committee on Science and Technology's Subcommittee on Space and Aeronautics held a hearing to examine the status of NASA's Near-Earth Object survey program. The prospect of using WISE was proposed by NASA officials. WISE will survey the sky in the infrared band at a very high sensitivity. Asteroids, which absorb solar radiation, can be observed through the infrared band. NASA officials told Committee staff that NASA plans to use WISE to detect NEOs, in addition to performing its science goals. It is projected that WISE could detect 400 NEOs (or roughly 2 percent of the estimated NEO population of interest) within the 1 year mission. January 1999 - NGSS is one of five missions selected for a Phase A study, with an expected selection in late 1999 of two of these five missions for construction and launch, one in 2003 and another in 2004. Mission cost is estimated at $139 million at this time. October 1999 - Winners of MIDEX study are awarded, and NGSS is not selected..
October 2001 - NGSS proposal is re-submitted to NASA as a MIDEX mission. April 2002 - NGSS proposal is accepted by the NASA Explorer office to proceed as one of 4 MIDEX programs for a Pre-Phase A study. December 2002 - NGSS changes its name to Wide-field Infrared Survey Explorer (WISE). March 2003 - NASA releases a press release announcing WISE has been selected for an Extended Phase-A study, leading to a decision in 2004 on whether to proceed with the development of the mission. April 2003 - Ball Aerospace is selected as the spacecraft provider for the WISE mission. April 2004 - WISE is selected as NASA's next MIDEX mission. WISE's cost is estimated at $208 million at this time. November 2004 - NASA selects the Space Dynamics Laboratory at Utah State University to build the telecsope for WISE. October 2006 - WISE is confirmed for development by NASA and authorized to proceed with development. Mission cost at this time is estimated to be $300 million. WISE Wide-Field Infrared Survey Explorer: updates.